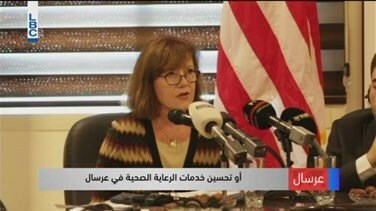 The US ambassador to Lebanon Elizabeth Richard stressed on Monday that her country is committed to supporting the efforts deployed by the Arsal’s residents in reviving their town and developing it. “I also today have the pleasure of announcing that the U.S. government is planning further assistance to the people of Arsal through our BALADI project,” she said. Richard added that the US is going to be providing new funding for up to seven new development projects in and around Arsal, adding that work has already started with the Arsal municipality and with community representatives so that to identify the top priorities. “These new projects could include additional transformers to stabilize and better distribute the electricity; it could include improving the agricultural value chain to benefit local cherry farmers; or improving health care services in Arsal among other things.,” she concluded by saying.